Glutton Honey: Yucky House is More Like It. Most of my friends are crazy about this place, and they talk about the salt & pepper calimari. My first and only time there, the big dining room was practically empty and we were met with a snotty host who implied that since we did not have reservations, he might not be able to seat us. He finally gave us a table right by the front door. From which, of course, we could hear him go through the same exact routine with every other party who dared to darken his doorstep. What, no reservations??? Oh, i don't know if we can fit you in...but by some miracle, everyone was seated. Not one party had a reservation. Wonder what happened to all the people with reservations. Okay, then, guess who comes to our table to take our order? Snotty door guy. I order the S&P calamari, he tells me No, don't have that, you won't like it. Hello? I've never laid eyes on you before, how the heck do you know what I'll like? He says it isn't any good. Okay. So I choose something else and we wait for our food...trying to ignore the THREE DEAD FLIES laying on our table. Then I notice tables around me ordering the S&P calimari...no one is telling them it's not good, not to order it. It comes, and people seem to be enjoying it. It looked pretty good. Maybe since I had never been there before the snotty door guy didn't want to waste one of their best dishes on me, maybe he was saving it for their regulars, I don't know. But it sure didn't make me happy. Can't even remember the dishes we did have. 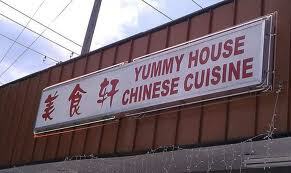 Food was okay, not particulary memorable. Using the restroom was a big mistake. It almost made me lose my meal. I don't care how much my friends like this place, never again. seriously. never again.